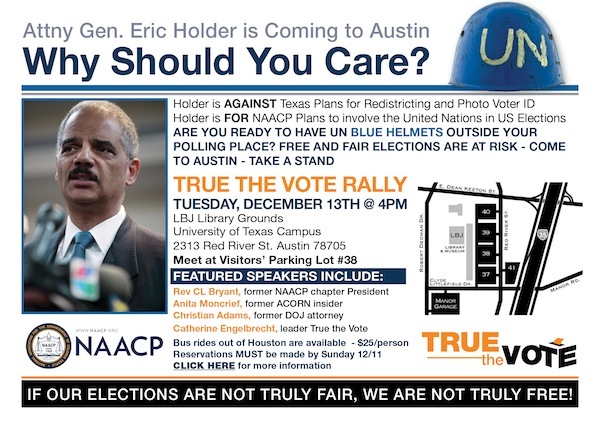 Attorney General Eric Holder, who has been getting a lot of attention lately due to the Fast and Furious scandal that led to the death of Border Patrol Agent Brian Terry, is coming to Austin tomorrow, Dec. 13th, to discuss voting laws and his opposition toward Texas' recently passed Voter ID legislation. Holder also believes that the current Texas redistricting maps are set up to disenfranchise minority voters. Furthermore, Holder is for NAACP plans to involve the United Nations on US elections. Catherine Engelbrecht of King Street Patrtiots and True the Vote will leading a counter protest tomorrow at 4pm at the LBJ Library in Austin. Please try to attend this event! Featured speakers include Rev. CL Bryant, former NAACP chapter President; Anita Montcrief, former ACORN insider; Christian Adams, former DOJ Attorney; Catherine Engelbrecht, leader of True the Vote.